The overlook beyond the shelter at the end of Chain of Craters Road in Hawaii Volcanoes National Park (HVNP) is currently the closest easy approach to the Kamokuna lava delta and entry plume, where active Pu'u O'o tube flows still issue into the waves. 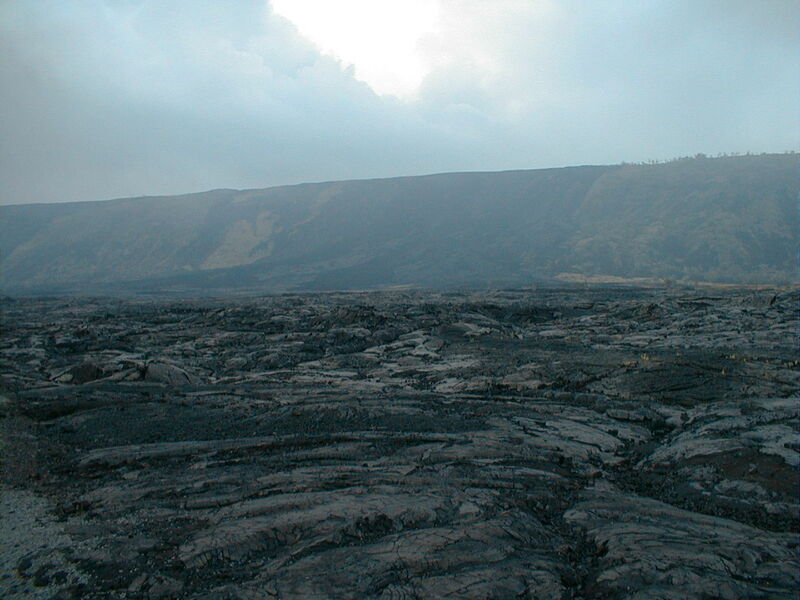 Surface flows from Kupaianaha, Pu'u O'o's sister vent, blocked the Chain of Craters road here in 1986. 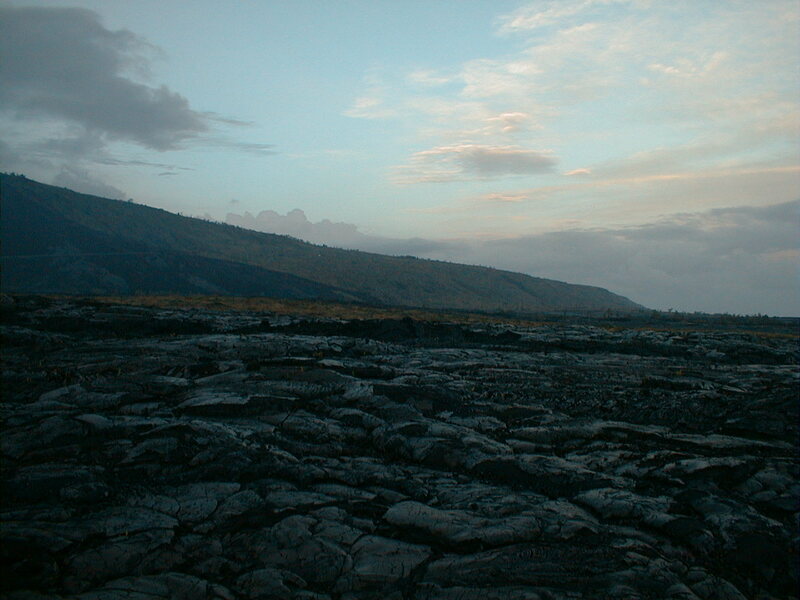 By June, 2000, the lava entry site had moved east a bit to Waha'ula, as seen in the updated flow map at right. An easy 300-meter walk east over pahoehoe flows from the road end will put you a little closer to the plume and well away from interfering car lights, but at best you'll still be well over 3 miles from the action. 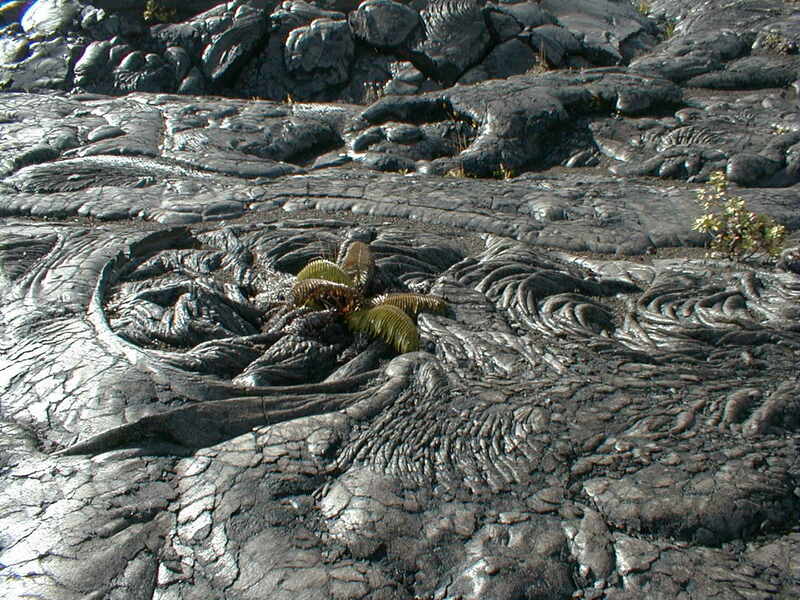 A hot, dry and arduous 4.5 mi day hike across the flows from the end of Chain of Craters road will buy you a chance to approach the actively flowing lava tubes as closely as the intense heat will allow, but there's no guarantee of a surface flow when you arrive. Bring a flashlight. 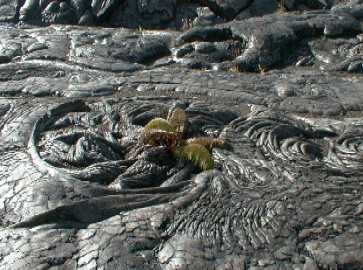 On dark nights, you may need to see your footing on the pahoehoe and you definitely need to stay well back from the sea cliffs. Bring binoculars, or any other viewing aid you can get your hands on. The view from here can be disappointing to the unaided eye. Allow 30 minutes to drive down to the end of Chain of Craters Road from the HVNP Visitor Center. Stay on the marked trail past the shelter and at least 100' back from the sea cliffs. The new land around here is unstable and may topple into the ocean at any time. Check out the high view from the turnout overlook at the top of the pali. I got nicer views of the action from here than from the low overlook at the end of the road. Try more than once. The action varies tremendously from night to night. Bring water, heavy boots and work gloves if you plan to hike out to the active flows. 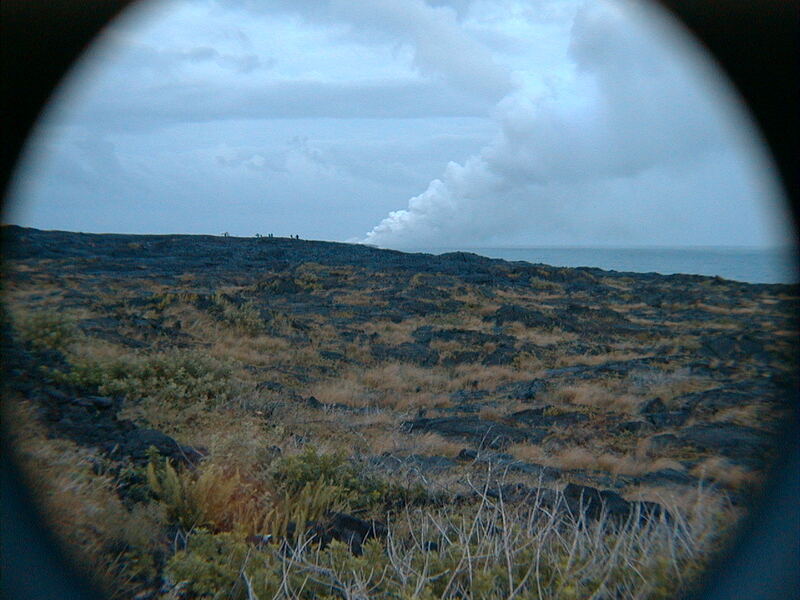 Buy a lava video at Jagger Museum at the Hawaiian Volcano Observatory on Crater Rim Drive. If you want to see lava in action, this is currently your best bet. The proceeds go for a good cause and the videos are enthralling. 198 KB Mauna Ulu flows drape the Holei Pali fault scarp and flood the coastal plain at the current end of Chain of Craters Road. The haze is vog ("volcanic fog"), a mix of water vapor and sulfur dioxide (SO2) emanating from the entry plume to the east (right). 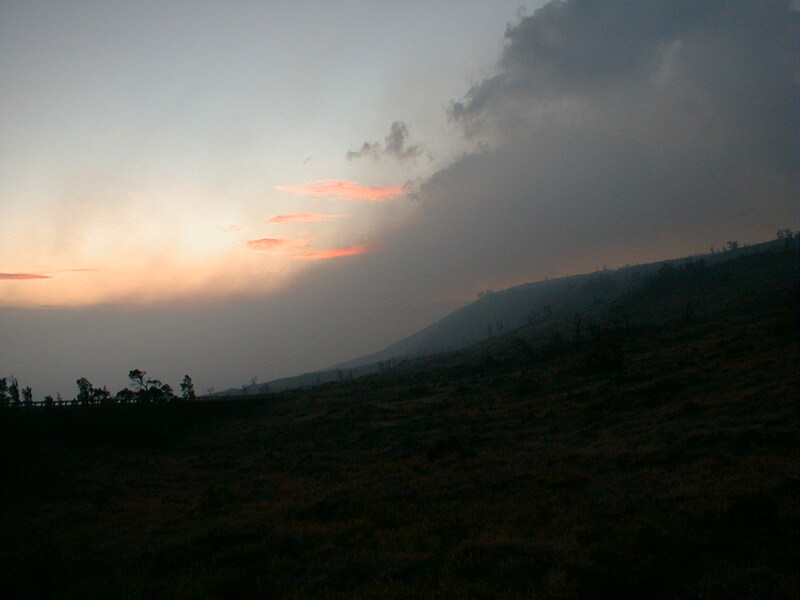 The trade winds typically push the vog around the south toe of the Big Island and far up the Kona coast. 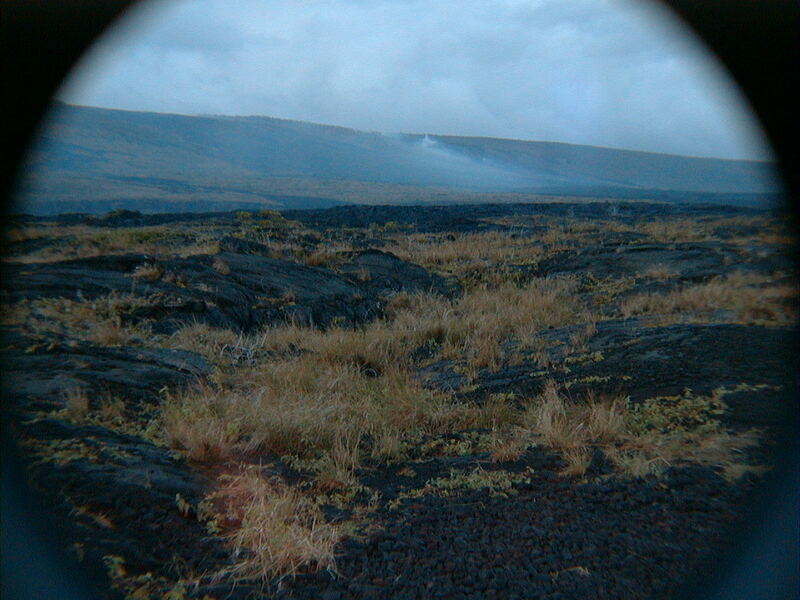 We had an entire week of vog in North Kona, nearly 100 mi north of South Point. 217 KB Minor steam plumes escaping from skylights in the active lava tube system mark the the middle segment of the 11 km underground route lava takes over Pulama Pali from Pu'u O'o to the growing Kamokuna lava delta. Pu'u O'o is out of sight just beyond the top of the scarp. 187 KB That's no cloud, that's the main gas plume from the Pu'u O'o vent, seen here now from an unnamed Chain of Craters Road turnout downhill from Halona Kahakai Overlook, just past the deep horseshoe bend roadcut at the top of Pulama Pali. When I took this photo, the plume was well above me, but a shift in the wind put me smack in the middle of it a few minutes later. A few minutes more, and the fumes sent me packing. The sulfurous smell of SO2 was unpleasant enough, but the feeling of asphyxia was the clincher. 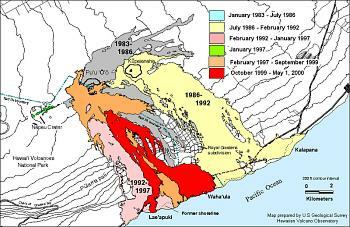 Hawaiian volcanoes typically degas most of the magma's CO2 and SO2 charge at the vent. Was it the CO2 content that made the plume so oppressive? 202 KB Looking NE along Pulama Pali, one of several active south-facing normal faults of the Hilina Fault System, which accommodates the gravitational collapse of Kilauea's unsupported south flank and creates its staircase topography. The scarp here is about 1500' high. 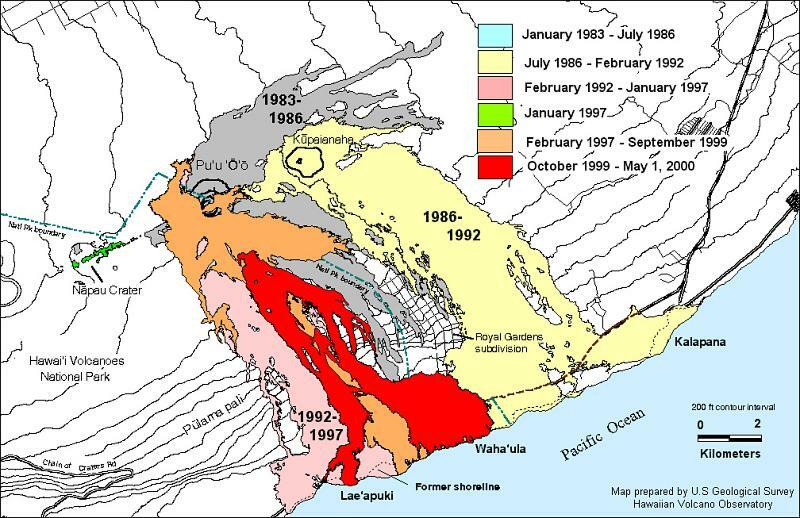 Centered on a similar fault to the east, the magnitude 7.2 Kalapana earthquake of 1975 signaled an 8 m (25 ft) slump of the south flank into the ocean; a small local tsunami ensued. 218 KB The Pu'u O'o lava entry plume rises above the Kamokuna lava delta, here with a 2.0x telephoto. The delta and plume are much better seen from the air, as on this site's Air Tour page. The plume was fairly subdued this particular evening, but rangers said it put on quite a show the night before.